Explore the nature wonderlands of the Boondall Wetlands & Cabbage Tree Creek at your own pace with our popular BBQ Pontoon ideal for the larger family or friends get together! Put a fishing rod in the kids hands and get them off the screens and out into the wonderful nature landscape! And bring Grandma too, lots of shade and comfort! Go out on Cabbage Tree Creek and out almost to the pier on Moreton Bay, as well as hanging at the mouth of Sandgate! The BBQ Pontoon is user friendly, easier than driving the family car and is suitable for up to 6 people. With the option for 4 hour or full day hire, you can choose what best suits you! 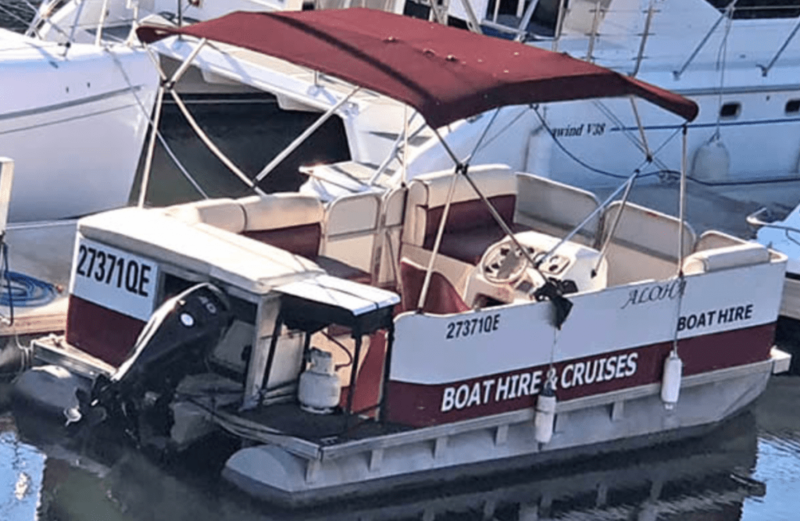 Our BBQ Pontoon Boat has cushioned seats, gas bbq, shade cover and are hired with all safety equipment. Explore Moreton Bay, swim, fish and enjoy a day out!